After more than 60 hours researching and testing at-home espresso equipment with assistance from Stumptown’s coffee education crew, we think the Breville Infuser is the best espresso machine. It’s part of the best espresso setup under $1,000, which includes the Rancilio Rocky grinder and all the accessories you need to pull great shots at home. This post was done in partnership with Sweethome, a buyer’s guide to the best homewares. 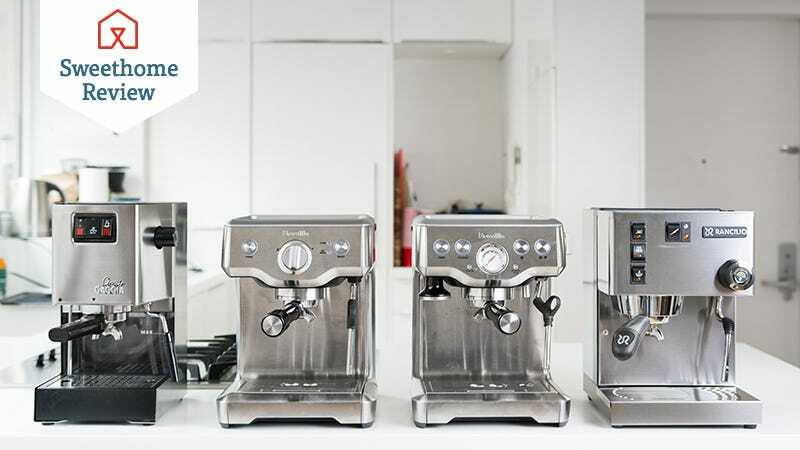 This is a condensed version of The Best Espresso Machine, Grinder, and Accessories for Beginners; read the full review here. This setup is for someone who likes good coffee and wants to take the time to learn more about the craft. But at-home espresso is not for the faint of heart. Tommy Gallagher from Counter Culture Coffee explained that you’re better off going to a coffee shop where the barista is trained, has dialed in the espresso already (meaning they’ve found the ideal grind size already), and uses a multithousand-dollar machine to ensure that what you’re drinking is at least moderately good. But if you’re interested in learning a culinary craft, an at-home espresso setup can be very rewarding. To find the best setup for beginners, we interviewed coffee experts ranging from award-winning baristas from some of Manhattan’s best coffee shops to the technical brains behind two of the most well-known roasters in the country (Counter Culture and Stumptown) to entrepreneurs who focus on connecting coffee enthusiasts (both professional and consumer) with the correct equipment. We also read through hundreds of articles and forums on coffee blogs such as CoffeeGeek and Home-Barista and other sites like Prima Coffee. Finally, we spent two days in the Sweethome test kitchen putting all the machines, grinders, and accessories through their paces with some assistance from Stumptown Coffee’s coffee education team. Among espresso machines selling for less than $1,000, the Breville Infuser stands out for its consistency, effective steam wand, and user friendliness. Not only could it make a single impressive-tasting shot of espresso, it could do so consistently with each successive shot once properly adjusted. That’s the hallmark of a good machine. It was also the easiest to use: It had the best documentation and most user-friendly design (with ample labeling and easy-to-read instructions), and it comes with most of the accessories you need to get started. 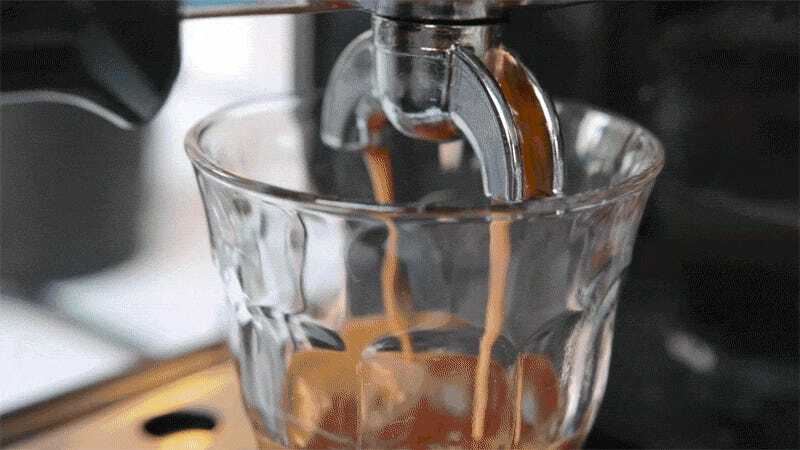 It’s everything a beginner could want in an espresso machine. Using the Infuser is a breeze, even if you’ve never touched an espresso machine before. First off, its water reservoir is removable so you can take it to the sink, fill it, and then pop it back into the machine—no fussing with an extra pitcher to ferry water into the machine, which competitors such as the Rancilio Silvia and Gaggia Classic needed. Press the Power button and the Infuser turns on. Less than a minute later, it beeps when the water gets to brewing temperature. We were able to quickly dial in the Stumptown Hair Bender blend in just a few minutes (here’s a quick primer on dialing in espresso). Tasters were all impressed by the consistency of the finished espresso coming out of the Infuser. Each shot had great mouthfeel and a good amount of crema (the dense and foamy part on top), like what you’d expect from a high-quality cafe. Though the Infuser’s best-tasting shots didn’t quite live up to those we pulled from the Gaggia Classic and Rancilio Silvia—we had a few truly barista-quality shots from the Silvia—those machines were more finicky to use and had lower lows that tainted their higher highs. For making milk drinks, the Breville Infuser’s steam wand was by far the best we tested. Though the steam wand does take a little bit of time to fully steam and heat the milk to temperature—about a minute compared with the 30 seconds you’d expect from a $1,000-plus machine—we found it was the only sub-$1,000 machine that was able to produce cafe-quality microfoam capable of producing latte art. The other machines just couldn’t get the foam to be dense enough. Among the four espresso-ready grinders we tested, ranging from $170 to $470, the Rancilio Rocky was our favorite. When Rancilio introduced the Rocky in 1989, it was one of the first home-use grinders with commercial-grade burrs. It was a hit then, and it continues to impress users decades later thanks to its ease of adjustment and consistent grind. To use it, you flip a switch and beans are automatically drawn through a chute into the open. We found that making small adjustments to dial in espresso on the Rocky was easier than on most other machines we tested. You simply move a knob on the bean hopper to the left or right. Compare that process with that of the Baratza Vario, which has a two-tiered adjustment system labeled with numbers and letters. The Rocky’s simple adjustment also makes it easy to flip between bigger grinds for drip or French press and back to espresso size again. The Rocky’s size (13.75 inches tall) and relatively quiet operation make it a much better pick for home use than the commercial machines many enthusiasts covet. The Mazzer brand, in particular, has a lot of popular models, but even the smallest—the Mazzer Mini—is almost 5 inches taller than the Rocky. It’s easy as 1, 2, 3—if you have five years of barista experience. Knock boxes are for disposing of spent grinds. We like the Cafelat because of its high-back design and removable bar for easy cleaning. A milk-frothing pitcher is necessary for making lattes and other milk drinks. Again, the Breville comes with a good milk-frothing pitcher, but its 16-ounce capacity is better suited for cappuccinos than lattes (because you need extra space to accommodate the foam), so we have a 20-ounce pick—also from Rattleware. And, of course, you need cups to pull shots into and drink out of. We like the 3.1-ounce version of the Duralex Picardie we recommend in our drinking glass review because they look great and are cheaper than porcelain alternatives. That’s why they’re gaining popularity at cafes around the world. And finally, if you think this sounds like too much stuff just to get a cup of coffee in the morning, we’ve got you covered as well in the What about Nespresso? section in our full review.